Hard blacks, glowing lines, characters with a sinister electronic twist to their voices, light cycles. These elements uniquely belong to the world of Tron; a single glance at the movie, and you know you’re back on the grid. You couldn’t be anywhere else. The story is centred around legendary software designer Flynn (Jeff Bridges) who has been missing for two decades, and his son Sam. When Sam receives a message from old friend Alan Bradley (Bruce Boxleitner) indicating that his father might still be alive, he is compelled to follow the trail. Entombed within a single server, deep inside his father’s secret laboratory, is a world where packets of information are expressed in visual form. Left in isolation since the 1980’s, this world has evolved from the set of simple instructions laid down by Flynn. Emergent life forms have begun to arise from seemingly nowhere. Programs can think, and are aggressively testing the borders of their digital realm, in defiance of their creator. Sam finds his father, stranded in the virtual realm since his portal to the physical world closed. Sam’s arrival has opened a new portal, but he, his father and digital life form Quorra (Olivia Wilde) must reach it before the evil entity Clue can get there first. It’s hard to say anything about Tron without first commenting on those iconic visual elements that I mentioned earlier. This is an absolutely stunning universe, fully realised. The design team have paid homage to, and surpassed, the original in terms of pure aesthetics. Those suits that light up with glowing lines and remind us of circuit boards are wonderful, as are the dark dystopian designs of the buildings and the elegant, powerful lines of the vehicles. The sound design is inspired, with game-like blips and bleeps that induce a stab of nostalgia in anyone born further back than the 90’s, and a thumping electronic soundtrack by Daft Punk. 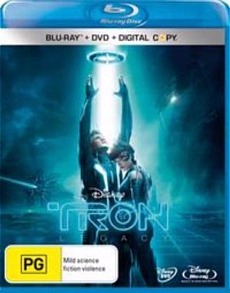 That retro mentality is what gives Tron Legacy its personality, and it is prevalent in all aspects of the production. The ‘games’ that the program characters must play to ensure their survival have the simple, immutable rules of an arcade coin-op. And Flynn himself is presented as a loveable relic from a previous age, with his constant use of ‘Man’ at the end of a sentence. If you can escape the thrall of the visuals and the sound, there are some weaknesses to be found with Legacy. The early part of the story (before we enter the artificial world) is disjointed; Sam is arrested for a serious act of corporate sabotage, and then released from his cell in a heartbeat. And if you look at the story as a whole, it is very linear. This is represented visually, as a straight line from Flynn’s hideout in the wasteland to the glowing orb of the portal in the distance: our protagonists’ goal is to get there before Clue stops them, and that’s about the scope of it. Thankfully, the performances of the actors are so captivating that they almost completely cover the thinness of the plot. Michael Sheen puts in a fantastic performance as the scheming Castor, and Jeff Bridges’ dual role as Sam’s father and his antithesis, Clue (made young again by a clever combination of body doubles and CGI) is truly memorable. The real strength of Tron Legacy is the way that these characters take part in all of these incredible scenarios and commit impossible acts, and yet it all looks and feels totally believable. There will come a point, during the film’s running time, when you will forget you’re watching a movie at all. For a movie in which almost every shot has some sort of CGI element, it says a lot about the skill of the actors involved. This copy of the film is presented as a 2-disc pack, including a DVD and a Blu-ray. It’s a great example of the difference in visual quality between the two formats: in the Blu-ray version the colours are brighter and more clearly defined and the blacks are deeper. If you own a decent sound system, do yourself a favour and crank up that bass- this film was made for it. Flynn lives revealed: A nice mocumentary explaining what happened to Encom and the world during Flynn’s absence. First look at Tron Uprising: A preview of Disney’s upcoming animated series, which is set before Legacy. Launching the legacy: A great doco exploring the passion of the people involved in the production. Visualizing Tron: An in-depth look at the visual aspects of the film. Everything from the importance of lighting to costumes is tackled. Installing the cast: Conversations with the production team, returning stars from the original and new actors. Disc Roars: Fans at a Comicon convention earn their chance to become part of the movie. Disney, director Joseph Kosinski and the production crew have done an amazing job at shedding new light on an old classic. While nodding to the original, Legacy boldly defines its own path. Without this film, a whole generation of kids might grow up not ever knowing what a light cycle was; and that would be a sad and terrible thing.